The Eastern countries and cultures have always fascinated travelers and China is an especially amazing country, so use this Newark to Chengdu flight we have found and discover this beautiful land. Book a flight with United Airlines and pay only $821 r/t for an airline ticket including taxes – over $200 less than any other airline’s offer.You can book this airfare deal on Faregeek but we have found it while searching Travelgrove’s offers. Keep in mind that the more merchants you select for price comparison the bigger the chance is to find the cheapest deal. On the screenshot you will see that you would depart on November 3 from Newark Liberty International Airport (EWR) and fly back on November 10 from Chengdu Shuangliu International Airport (CTU). You will have to change planes both ways in San Francisco first for 3 hours 48 minutes and then for 12 hours 35 minutes. If you book this flight to Chengdu you will get 18,830 award miles from Lufthansa SWISS Miles and More. If you book United’s airfare for $821 r/t you will save exactly $204 on your flight minimum as the next best fare – a Cathay Pacific deal – costs $1,026 r/t. You can find all the deals below. 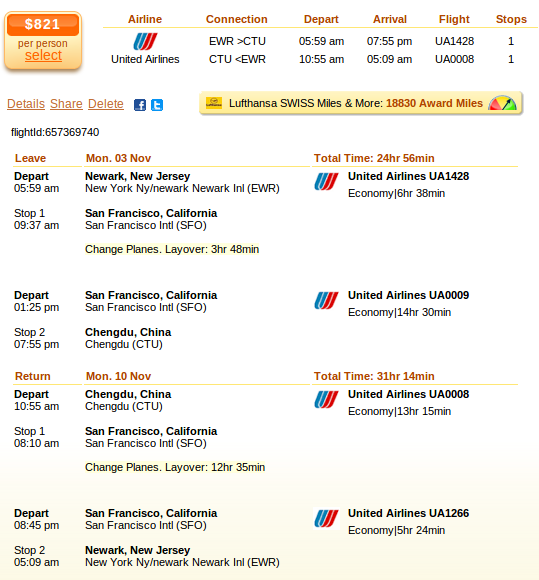 This entry was posted on Monday, October 20th, 2014 at 4:22 am and is filed under Airfare Deals. You can follow any responses to this entry through the RSS 2.0 feed. You can leave a response, or trackback from your own site.